Eight years ago, Tsubaki, a daughter of a successful businessman, was reluctantly given to the Yoshiwara, the red light district of Tokyo, after a tragic fire burned down the entire family's wealth and belongings. Shin, a childhood friend of Tsubaki's, coldly turned his back on her now that she was poor. Furious, Tsubaki, threw herself into becoming a top oiran girl to beguile him with her looks and then reject him one day! But plans are never as easy as they seem. For one, the beautiful and cold-hearted Takao stands in her way. I'm surprised to see Oiran Girl has never been reviewed on MAL. Although it's a regular historical shoujo in terms of story (heroine that lost all her fortune, forbidden love, the dashing hero who protects her and is obviously deeply in love but is bound by the shackles of their previous master/servant relationship, the obvious historical setting of Yoshiwara, yada yada, you know the drill), the delicious art and the most wonderful expressions of the characters turn it into a worthy read. Obviously, not the first and not the most original manga about Yoshiwara, it still manages to grab and hold your attention from the beginning until the very end. You can see how much time and effort the mangaka has invested into research in the great detail of art, especially the kimonos and hair accessories. Personally, I was captivated by both masculine Shin and his oiran personality Takao. The gender-bender is a major part of the story and how Shin switches into Takao-mode and back was done very well - the eyes, the expressions, the attitude - you just have to see it! The way Takao bullies Tsubaki and their constant banter are a great comedic relief, but each time Shin surfaces, he makes your heart swoon. Towards the end the manga becomes a bit rushed, but it still manages to wrap everything up nicely. Although the story is weak at times and the character development is quite obvious, my overall score is a solid 9, simply because Oiran Girl is a very beautiful and enjoyable manga. I've always thought courtesan houses interesting, seeing the culture difference between Japan and America. In lower terms, people would describe such courtesans as "high-class prostitutes". But a deeper dive into the culture reveals more of what the courtesans offered before sexual services, such as entertainment in multiple arts like tea-serving, dancing, and more. Don't get me wrong; Oiran Girl isn't a super informative manga about Tsubaki's transition from mere girl to oiran. Though the manga is built on history, it's more dependent upon the new characters and conflicts introduced every chapter that could threaten Tsubaki's ascension to top courtesan or possibly reveal oiran Takao's greatest secret. I'm not so much a fan of boys that are pretty enough to disguise as women, but the humor was great. I laughed out loud a couple of times because the situations turned out too silly, and not in a bad way. It's amazing how well a man can disguise as a woman in an all-female house. Tsubaki's frustrations with an elder oiran sister who bullied her in public and acted caring in private were hilarious. A few cliches are sprinkled here and there, like that divide between social classes that inhibits romance and an incredibly dense protagonist, but setting those aside, I did enjoy the story. Despite the growing love interest, I was very interested in Tsubaki's development as a courtesan and a mature young woman. 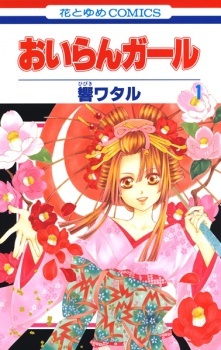 Tsubaki certainly shines in this manga, especially since she is the apprentice of the famous and beautiful oiran Takao. Clients recognize her strength as a rising courtesan. She's also a very headstrong individual, not letting men push her around unless she really has to. She comes to realizations quickly and will fight for what she believes is right. Even with her frequent bouts of anger towards oiran Takao and her denseness in regards to others' feelings about her. She's definitely a heroine with flaws, but she's typical compared to other strong female protagonists in shoujo manga. The other protagonist and main love interest is Shin, parading as oiran Takao in the courtesan house. He quite discourteously rejected Tsubaki after her confession as kids. As a woman, he's very cool, attractive, and in control. His personality as a man is much the same. Rarely is he ever unsettled, except in certain situations involving Tsubaki. A lot of times he inhibits himself from acting any more caring toward her because of their statuses as master and servant from long ago. Other than his true gender, he hides more secrets that Tsubaki is unaware of. While he's definitely the kind of guy that many readers swoon over, he's also quite normal to shoujo manga male love interests. He was a little bit too conveniently there at times when Tsubaki was in trouble and his constant denial of love for her was a little bit annoying when it was so obvious. Nevertheless, he serves his purpose. The best part of this manga was the artwork. While the eyes and body structures were normal for modern shoujo manga, I was quite blown away by how detailed the kimono and hair ornaments were. The mangaka certainly did her research in order to illustrate clothes of the Edo period correctly and beautifully. Even the patterns on the robes were detailed, and I was never disappointed each time I turned the page. The eyes are always expressive and the shading is done well enough to tell the mood of the panel. If any readers picked up Oiran Girl for the romance, the nature of the love between the main pair is similar to that of a forbidden one between two people of different social classes that suddenly gives in. I can't say that it's anything special. Much of the society restrictions that they are thinking of are merely ones that they put on themselves since they don't belong to the same house they did before when they were kids. However, it was a charming and entertaining read with a little oneshot in between (which was okay) which made me laugh a bunch of times. I loved the artwork and thought the ending was a little messy, but I suppose by the last few pages it worked out. The manga was exciting to me because of its history and made even more entertaining by its comedy, so I think it was worth reading. WOW, I can't believe this isn't a more popular read. That being said, I had low expectations when I started reading, and almost stopped reading 4 chapters in, but decided to stick it out for a few more just in case. I am so glad I did! The main female character, Tsubaki, is a strong female lead without being over-the-top aggressive or so in charge that it's unrealistic. She has a mind of her own and saves people from situations, but also gets saved herself, which I find a lot more realistic than other female leads who are either one or the other. I found her to be an extremely likable main character without her being too weepy or too tsundere. The main male lead, Shin, I had to learn to like. At first I was a little thrown off by his situation (and one of the reasons I almost stopped reading) but after a few chapters I was extremely impressed: he was respectful, handsome as heck, funny, and unpredictable at times. His few spots of jealousy, when he's normally in control, also added elements of realism for me. He was neither too possessive, nor too passive towards his love. He was also willing to be tough on his romantic interest, and push them to be a better person, but was also surprisingly gentle at times. The story itself carries a few surprises. The last volume was a whirlwind, but despite going in a surprising and different direction it didn't detract from the main story or the characters at all. I was pleasantly surprised!! So, in summation: this is a good quality shoujo manga, with likable characters, beautiful and flawless art, with a healthy dose of romance and humor, and unpredictable story lines. I loved this manga, and feel it should be much more popular if more people give it a chance! Wolves with silver eyes who can transform themselves from beasts to humans and from human to beasts. Only one has been said to be alive. The whole village is busy hunting it down and kill it for a reward. One of them is Sakura, her brother is ill so she needs the money. So what will happen when the wolf and Sakura meet? The story is really amazing. It's very original and exciting to read. It's not a typical shoujo manga. While reading you want to kow more. Until the end of the story you don't know if it's a tragic or a happy ending. I give the story a 10, 'cause it's a really nice story. The art is nice. It doesn't disturb at all. I wouldn't call it an original artstyle, because in my opinion it isn't. But I guess it's okay, so I will give it a 7. Then there are the characters. There is the girl. I guess I hated her for a second but a few pages later I really liked her. It's not like there are many developments, because it's only a one shot. So it's hard for me to score this one. I think they both didn't have that much of a strong personality but they were likeable. They were so-so. I will give the characters a 7. Because of the outstanding story, the enjoyment for me was very high. There were times that I didn't like happenenings. But at the end I was fully satisfied, and everything I didn't like of the one shot disappeared. So I give enjoyment a 9. Overall it was pleasant to read, while reading I got more curious about the end. How would it end? Is it possible to have a happy ending? For a one shot I thought it was really good, so I give it overall a 9.